The cutting edge of neurolinguistics meets the spiritual wisdom of the ages in a handbook of key words that literally rewire our brains. New discoveries in biology and the neurosciences are revealing how the structure of language-the words we think and speak-can actually change the way the neurons in our brains and hearts connect. But our ancestors understood this connection intuitively, thousands of years ago. They created specific word-patterns to provide comfort, healing, strength, and inner power in difficult times, and they encoded these powerful words in prayers, chants, mantras, hymns, and sacred writings to preserve them for future generations. Now beloved teacher and thought leader Gregg Braden cracks the code and puts these powerful words in your hands. Perfect as a pocket guide, a reference for spiritual study, or a gift to someone you love, this elegant, compact book contains Wisdom Codes that cut to the core of life's greatest tests, most challenging demands, and hardest lessons. You'll find chapters devoted to healing from loss and grief, facing your unspoken fears, finding certainty in the face of uncertain choices, and finding forgiveness, as well as ancient parables that offer a "fast track" to unraveling life's deepest mysteries. Each Wisdom Code-distilled from a quote, a scripture passage, or a parable-is accompanied by a brief discussion of what the code means, why it's important, and how to apply it in your life. 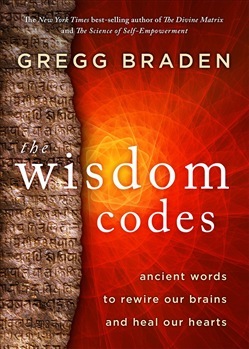 Acquista Wisdom Codes in Epub: dopo aver letto l’ebook Wisdom Codes di Gregg Braden ti invitiamo a lasciarci una Recensione qui sotto: sarà utile agli utenti che non abbiano ancora letto questo libro e che vogliano avere delle opinioni altrui. L’opinione su di un libro è molto soggettiva e per questo leggere eventuali recensioni negative non ci dovrà frenare dall’acquisto, anzi dovrà spingerci ad acquistare il libro in fretta per poter dire la nostra ed eventualmente smentire quanto commentato da altri, contribuendo ad arricchire più possibile i commenti e dare sempre più spunti di confronto al pubblico online.